53 miles with plenty of hills. We were joined by the Flying Scotsman (aka Gordon) at the cafe, and then on the way home he was coming the other way down Shellow Lane, having been back to Macc ahead of us. There's no stopping the man. Lesser mortals on the actual ride were Steve P, Russell , Mark Boo, Paul AJ and Dave W. My average speed 11.6 mph, home for 3 pm. Fell asleep watching the telly. Giddy life, eh? Nabbs Road on the way out, Shutlingsloe in the background, Shuffling Mark Boo in the foreground. 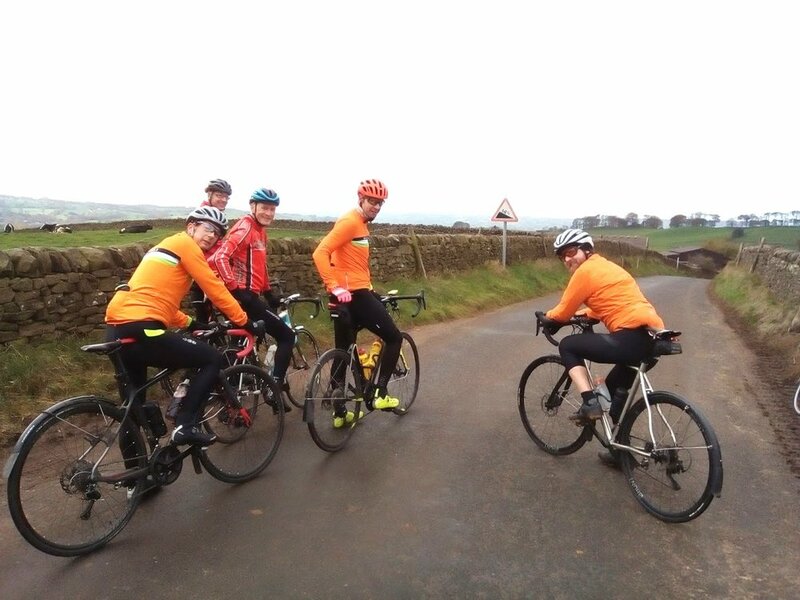 Still smiling at the Ride Leader after climbing Thorncliffe Bank. I’ll take that as a plus point. Top of Lask Edge on the way home: Paul, Mark, Russell, Dave.